Ok, let's talk a little bit about your options for which type of trucks you can drive. Everybody has seen these trucks a million times, but there are a lot of points to consider when figuring out which one might be right for you. A dry van trailer is the most common type of tractor trailer on the road. The trailer is simply a box on wheels, nothing more. You will haul anything and everything that can fit in the box and doesn't need temperature control. It could be food, clothing, auto parts, building supplies, etc. Almost anything. Even liquids in containers varying from buckets to drums to totes can be put in there. I'm telling ya, almost anything. Dry van is the simplest form of tractor trailer job because there are really no specialized concerns unique to it. You don't need temperature control, you can't haul open liquids like a tanker can, you can't haul anything that needs to be dumped or pumped out, and you can't haul oversize loads. It's simply a matter of “throw it in the box and off you go”. You may at times have to haul hazardous materials, but that isn't unique to dry van. 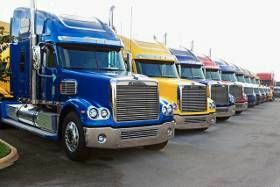 Because pay in any form of driving is partly based on specialized skills required and/or difficulty of doing the job, the only thing you will really find that will significantly boost your pay in this form of trucking is to take a job that requires you to load or unload, but this isn't too common. Dry van is the simplest form of tractor trailer job because there are really no specialized concerns unique to it. All jobs may at times require what's called “driver assist” which can mean helping them unload somehow, but it's not too often and it's usually no big deal. It may just mean counting the product going onto the trailer or moving pallets out of the way. No biggie. Most of the jobs which involve loading or unloading are local or regional jobs (mostly local). There isn't much else to say about dry van. The other types of trucking jobs are more specialized, so we'll differentiate them here one at a time.